273/365 krispykreme, originally uploaded by ajbrusteinthreesixfive. 272/365 lightsout, originally uploaded by ajbrusteinthreesixfive. 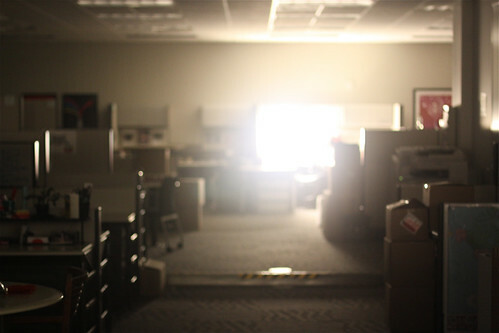 the lights out at 9pm thing at the Coke office is starting to get old pretty quickly. I anticipated the lights going out tonight and set up camp in a meeting room with light switches figuring the switch would overrule the timer – well, it didn’t. Oh well. As I left I saw this desk – where no one was sitting – with one single desk lamp on but it felt crazy bright due to the darkness of the rest of the office. 271/365 pemberton, originally uploaded by ajbrusteinthreesixfive. we spent the day in the meeting room at the World of Coca-Cola. We were plotting. It was a long day but a good day. 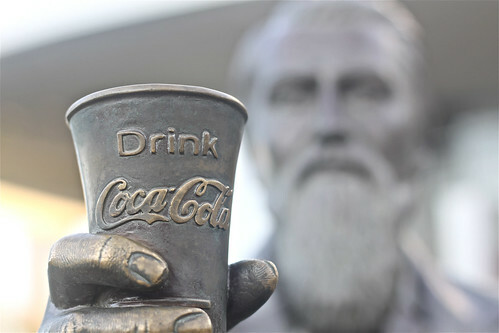 And then we left and I went by to say hi to our old friend, the inventor of Coca-Cola, John Pemberton. He is still right there in Atlanta offering us all a Coca-Cola like it was 1886. John, I owe you one. 270/365 vortex, originally uploaded by ajbrusteinthreesixfive. 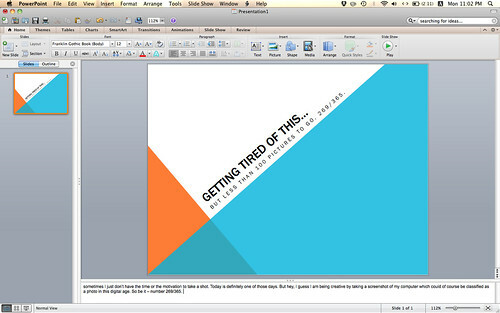 269/365 powerpoint, originally uploaded by ajbrusteinthreesixfive. sometimes I just don’t have the time or the motivation to take a shot. Today is definitely one of those days. But hey, I guess I am being creative by taking a screenshot of my computer which could of course be classified as a photo in this digital age. So be it – number 269/365. 268/365 babyprison, originally uploaded by ajbrusteinthreesixfive. 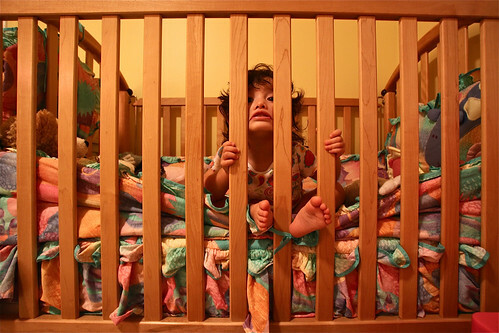 the crib is kind of like a baby prison. That is why I like it and why I am hesitant to get Nyla her big girl bed. Once she gets in her prison, she can’t get out. And as I put her to bed tonight I decided to take today’s picture with her and her jail cell – and it didn’t take her long to figure out what was going on and take on the role perfectly. 267/365 eighties, originally uploaded by ajbrusteinthreesixfive. today we went to a friend’s 40th birthday party and the theme was 80s. I put no thought into it until one hour before we had to go and picked up everything with bright colors and weird patterns – including my killer 80s Miami Dolphins spandex Zubaz shorts and my fro with pick and all. Picked up some killer vintage Nikes too. Toshimi also went for the closet scavenger hunt look but put it together pretty nicely, with belly and all. The Dolphins shorts were a hit, but we were considerably outdone by the birthday boy, his wife, and many of their friends including one who came as Jane Fonda with the one piece leotard. Awesome. I was handicapped though – I didn’t really live through the 80s at and age where I could pick out my own fashion – I blame all my fashion mishaps from that decade on my Mom and Dad who were responsible for dressing me.